Let's talk about how much I love this clever storage system and how much you will in a moment after you see this photo below, ok? It's by a Danish company called Bloomingville and is sold piece-by-piece so you can customize it to suit your needs. 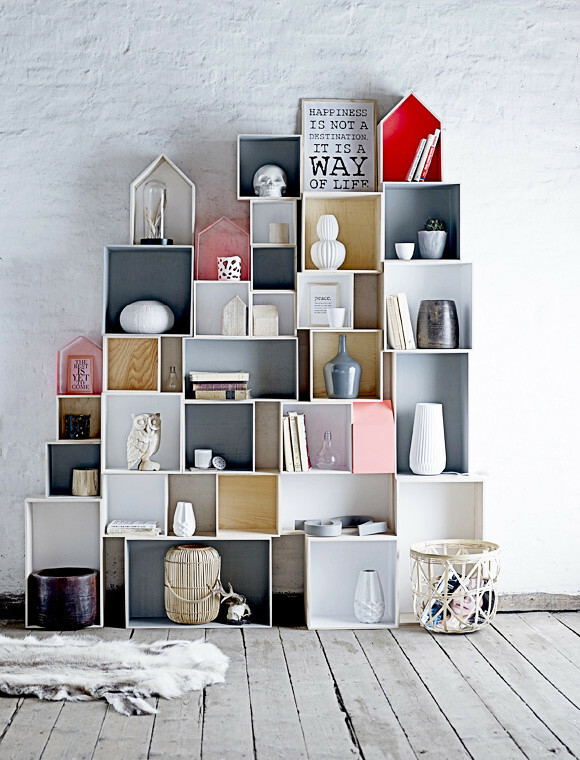 This certainly isn't a new concept, modular storage systems have been around forever, but I really love how this one looks all styled up and that some of these are shaped like houses - co cute! What do you think? Would you do this? If you live in Germany and want to order these, visit Car Moebel's website here. If you live elsewhere, contact Bloomingville directly. Do you love this or not? Thoughts? I want to do this so bad!